Chinese New Year started on 14th. In Malaysia, we have public holidays until today. Last night, we went to Ferringhi Garden Restaurant with Akiko & Maki's families. It's really nice restaurant and it must be better dining there without kids. 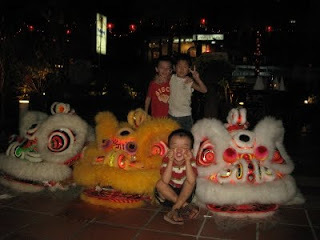 However, in Malaysia, lots of children are out and about until late evening. Lucky enough, the restaurant had Lion Dancing and fireworks. We all enjoyed the night. Our children were happily playing around all the way. I had to drive the windy roads at night for the first time, as Jason had enjoyed drinking very much.